The Plot: Present day DCI Sam Tyler gets hit by a car and comes to in 1973. He's still in Manchester...but it's not the Manchester he knows. Is he in a coma? Going crazy? Or did he really go back in time? Tyler winds up working in the 1973 Manchester Police Department. Doing the same work; except it's all changed. No DNA, no fancy CSI-style forensics. And the rights of accused criminals? You're kidding, right? Tyler repeatedly comes into conflict with his boss, Gene Hunt. OMG is there any better character on TV than Gene Hunt? Swagger, sexist, loud, rude. But just as dedicated a cop as Tyler. So basically this is a terrifical cop show set in the 1970s. From the POV of a modern day detective, who is often frustrated by his 1970s counterparts. With the twist of what the hell is going on that Sam is in the past and meeting his own mom? Sam has to adjust to the different way of being a police officer; not to mention the clothes and music of the 70s. 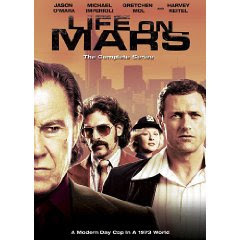 I really, really want to get Life on Mars (UK Soundtrack) for the music. Life On Mars also did a great job with the editing; I may not know the UK 70's era police shows they were alluding to, but I got that it was being done. Same for the history; I probably didn't appreciate all of the historical things Sam was living through, but I did get that he was living through what was, to him, history. Last point: after two seasons (UK seasons, so short for us), the show ended with a resolution and explanation of what was going on with Sam and why he was in 1973. Some episodes are similar, not just the dialogue, but actual shots and staging and editing. Either you're the type of person who doesn't like that; or you're the type of person who does. I like it; I like seeing how something is reimagined and rethought. I like how the UK version is made new, fresh, different. Part of the changes included giving Sam Tyler a different reason for being blasted into the past. Which is GREAT. And, frankly, I thought the US version was a bit tighter when it came to the reason and I thought it was less rushed than the UK version. Which is odd, because the US version was cancelled mid-season, so they had less time to wrap it up than the UK. What else is great? Dean Winters. It's a TV fact: Any show is made better by Dean Winters. I liked both versions of this show, but have to say I LOVED the US one just because I was young and gay in NYC at that time and they did a terrific job capturing it. I LOVE Gene Hunt...he is my big crush now and my husband thinks I am a little insane. I haven't watched the US version yet but I think I will soon! Have you seen Ashes to Ashes? If any of your readers would like to win a three book set of Patrick Carman's Atherton series, I am giving one away on my blog, MsYinglingReads. Thanks! I watched the BBC America version and loved it. I was also a huge fan of the U.S. version. I was disappointed when it got canceled but I thought the resolution was very satisfying. The music was fantastic in both of them. 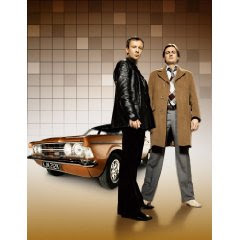 I've only watched one episode of Ashes to Ashes and did not find it nearly as interesting, as Mars, even with Philip Glenister continuting his role. Maybe I should have given it another chance.